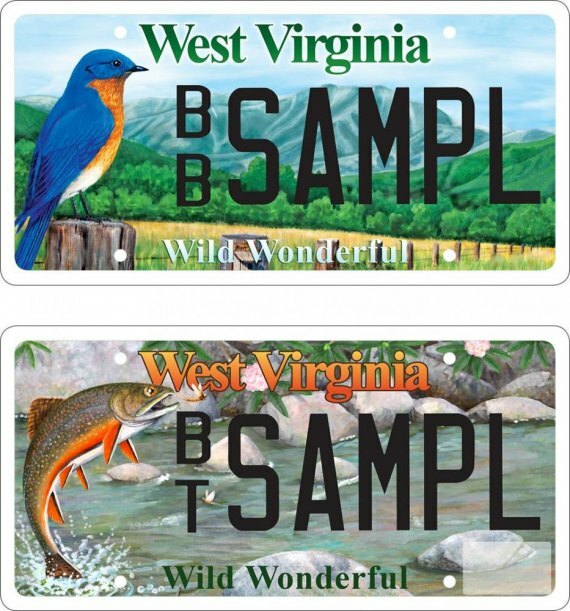 SOUTH CHARLESTON, W.Va. – Two new wildlife license plates are now available to West Virginia motorists, one featuring a native brook trout and the other an Eastern bluebird. The plates are a joint offering by the Division of Natural Resources (DNR) and Division of Motor Vehicles (DMV). Previous wildlife license plates have featured a rose-breasted grosbeak, a white-tailed deer buck, and a black bear with a cub. All have been popular with car owners in West Virginia. The license plates are more than just decorative. In 1996, West Virginia voters approved a constitutional amendment which earmarked a portion of the proceeds from the wildlife license plate sales to fund West Virginia’s Wildlife Diversity Program. The cost of each plate is $55 for the first year, with renewal costs for subsequent years at $45. Fifteen dollars of each purchase go toward the DNR Wildlife Diversity Program to help conserve the state's nongame animal species and rare plants, provide educational materials to schools and libraries, develop wildlife viewing areas, and support other programs designed to educate the public about the state's wildlife resources. Customers may exchange their current license plates at any DMV regional office or by mail at the time of renewal. Additional information about the new wildlife plates is available by calling the DMV at 1-800-642-9066 or by visiting the DMV web site at www.dmv.wv.gov and clicking the special plate’s link.